Mt.Yokote Ski Resort (横手山スキー場) has one of the longest ski season in Japan. It is located in Shiga Highland, Nagano prefecture. The slope of Yokoteyama is located on the highest place in Japan. Its altitude is 2,305m. 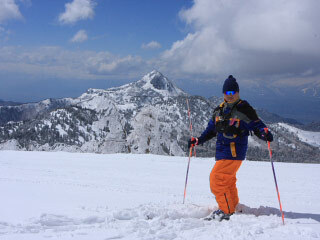 Because it is located so high on the mountain, you can enjoy ski until May. There is parking and restroom. One Day lift ticket: 4,800 yen for adult, 4,000 yen for senior and 2,400 yen for kids. Deposit for the card: 500 yen. 1. use Nagaden Nagano Line to Yutanaka. 2. use bus to Hasuike. The best hand made Futon. Get Kanji for your name and Hanko for your Kanji. okoteyama Ski Resort is the highest ski resort in Japan. Its altitude is 2,305m from the sea level. Because it is so high up in the mountain, Ski slopes are available until May. So, it is very popular Spring Ski Spot. There are 4 different kinds of courses. The main feature is the longest easy slope for beginners. On the top of the mountain. There are Starbucks Coffee and Bakery they both the highest altitude in Japan. It's season starts from November to May 6. There is a Ski school.